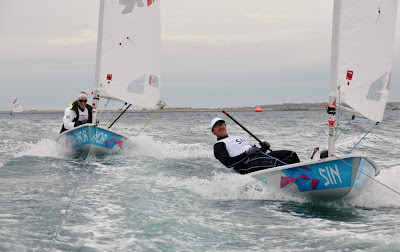 Speculation about US Sailing woes and its subsequent ‘recovery plan’ often suggests possible solutions such as: to increase funding, restructure Management, re-evaluate College sailing/racing, change junior classes of boats etc etc. But here is a thought: Provide each class with top level coaches and give them full autonomy of that program within a budget. If they can’t produce progressive results or improvements in ISAF rankings within a defined probationary period of time, then they are out. A confident Coach would accept this and see it as a small risk. A reward may be to provide performance bonuses for Coaches that achieve the targets set. The Coaches role is to improve the sailors performance and this should be the sailors and the Federations expectations as well. For some reason, this is not always the case. An example of what is possible: Spend US$50k for 5 months prior to Olympics. This includes all coaching, travelling, entry, car hire, coach boat charter etc. ISAF ranking improves from 62 to 19 within this period and achieve a result of = 15th at Olympics. This is possible with any sailor from any country with the appropriate commitment. In other words, a coach driven system that designs a performance based program that is not compromised in any way. Attracting the right Coach that could manage such a program would be the first step to improvement. Do this for each class and have full Federation support, both financially and strategically. This is deceptively simple and will yield excellent results with the right people involved. Especially as some of the US Olympic sailors seemed to suffer a real dip in performance in the last few months leading up to the Olympics and at the Olympics itself. Yes, it should really separate the average coaches from the ones who really know what they are doing.